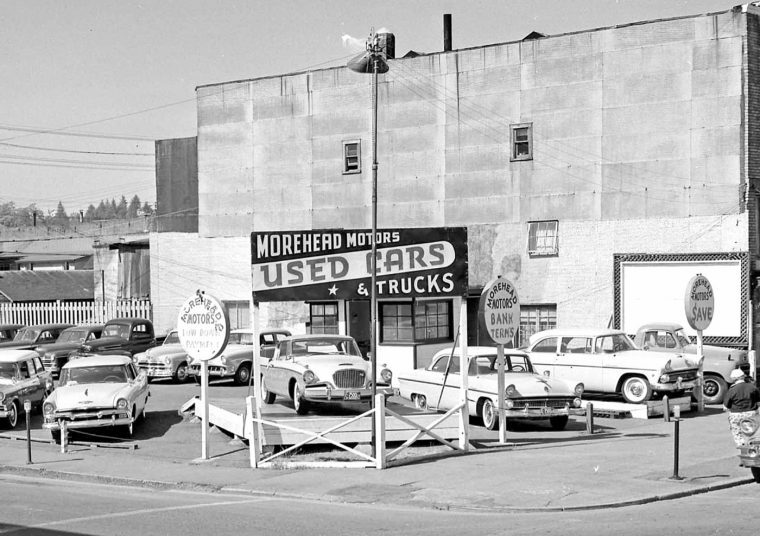 Morehead Motors, a Studebaker and Packard dealership was operated by the Morehead family in Aberdeen, Washington on Market Street. 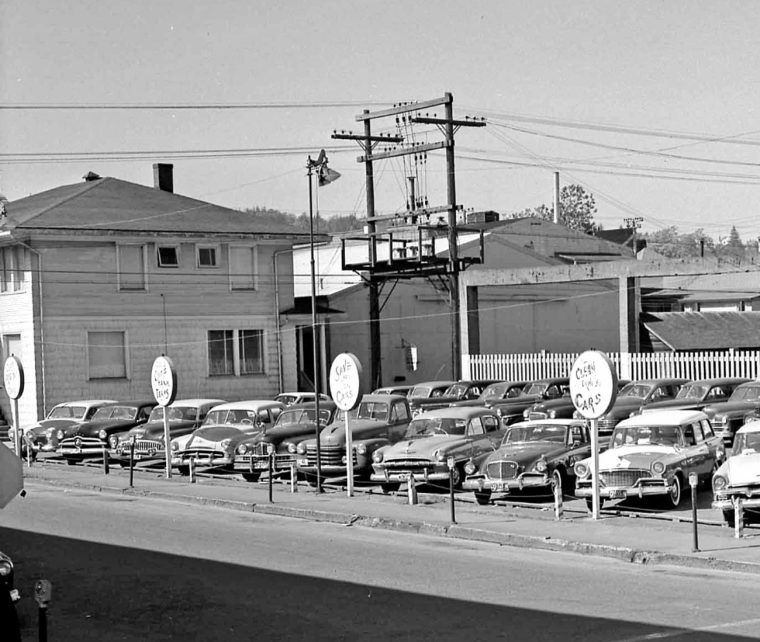 Today’s feature image dating to 1955 contains a view of Morehead’s Used Car and Truck lot in a separate location. Aberdeen is a small city located one-hundred and ten miles southwest of Seattle at the confluence of the Chehalis River and Grays Harbor fifteen miles inland from the Pacific Ocean. Share with us what you find of interest in this photograph courtesy of the Jones Photo Collection. This entry was posted in Auto photos 1946 - 1965, Garages and Dealerships and tagged 1940s Cars, 1950s Cars, Morehead Motors Studebaker and Packard. In the lead photograph, parked in the lot on the far left, is a four-door 1951 STUDEBAKER and four cars to the right of this vehicle is a 1950 PACKARD Custom. The 4th car to the right of the ’50 PACKARD is a 1956 STUDEBAKER Pelham Station Wagon. Between the Pelham wagon and the 56 Golden Hawk is a 55 Plymouth sedan powered by the ancient flathead six (V8 would have had a “V” emblem on the front of the hood). Good catch with the emblem on the ’55 PLYMOUTH and its engine. There doesn’t appear the vehicle has any side moldings, so would be either a Plaza Club Sedan or Business Coupe. In the lead picture, on the far right parked on the street, is the front fender of a 1956 BUICK. Given the Studebaker 2dr. wagon & the Hawk on the display stand, I’d date this image to at least `56. The two `55 Ford Customlines are probably low-mileage, being only a year old. This and other photos of Morehead where all taken at the same time, are dated 1955 and could have been taken late in the 1955 model year. In Item 2 of 2, from the left I see a ’50 Studebaker, a ’49 Ford, a ’53 Buick Riviera, a ’51 or ’52 Plymouth, a ’49 or ’50 Packard Super Deluxe or Custom, a ’53 Plymouth Cranbrook, a ’56 either Flight or Power Hawk, a ’56 Pelham wagon and a ’55 Plymouth. A 56 Hawk sedan like the one next to the wagon would be either a Flight Hawk with a flathead six, or a Power Hawk with a 259 V8. The Hawk on the stand is a 56 Golden Hawk with its one-year-only factory installed 352 Packard Clipper V8. In 56, the only larger engines were the Senior Packard 374, the 365 inch Cadillac, the 368 inch Lincoln, and the 354 Chrysler New Yorker and Imperial. But only two years later, Ford, Chevy and Plymouth all had 350-inch (give or take a couple of cubes) V8s, and three years after that, all three low-priced cars had 400-inch V8s (again, plus or minus a few cubes) that grew larger throughout the sixties. But in 56, a 352 was a huge engine for a car that was only a couple hundred pounds heavier than a Chevy. That 56 Golden Hawk on the stand sure brings back memories. Dad worked at a Studebaker dealership, and they sold and serviced a 56 GH to an elderly lady and her husband who kept it for 9 years then traded it in at another lot. I had just got my drivers license and we were going around looking at various cars. I wanted this Hawk badly, so Dad finally took me out to the car lot it was on and we went for a test drive. I spun it around in the road when I shifted to 2nd, Dad made me stop, get out, and he drove us back to the lot. Messed that up, didn’t I , but him not letting me buy it probably saved it’s and my life, ha ! First image, extreme right side of the front row, up against the building is a small two door – but what? Hood is shaped like an IH truck, signal atop the front fender, but dimensions are odd. We think it is a Studebaker by the shape of the cab, lowness to it compared to an International, the amount of cab behind the door frame, and the roundness of the fenders. International fender are more flat on top. It does look like an International emblem though. Against the building is a heavy-duty truck, likely a Studebaker Transtar from 1956. A “LOT” full of a lot of variety, Chevys, Fords, Buick, a nice 1952-53 Chevy pick up, a Ford Pick up in the back and a Studebaker on the right. I especially like the lollipop signs around the perimeter of the lot. I’m wondering what that is that appears to be a big beam extending out from the building above the picket fence and what purpose it has. I also have to add that I have never seen telephone polls set up like that before. The utility poles are located on either side of the alley with cross arms to support the 3 phase power lines that run down the center of the alley. Thanks for the power line explanation. Chris, it is a Studebaker. Most of these with that front end design were 4 cylinder GMC diesels. I believe they were identified as 96 BBC models. It is not the heavier duty diesel model with the shorter nose. The post just cuts off the rest of the hood and grille. We can see one half of the two-piece S-T-U-D-E-B-A-K-E-R name plate in the new -for-56 hood. The Budd wheels tell us it is a 3/4 ton or larger. Lot of older models in the back row that probably remained unsold and headed to the scrap heap as 1955 brought about some major improvements in styling, performance and comfort. The GH deserved the Pedestal of Honor there! According to Bob’s Studebaker Resource Website, Morehead Motors had two addresses listed on Market Street, 110 West and 220 West. 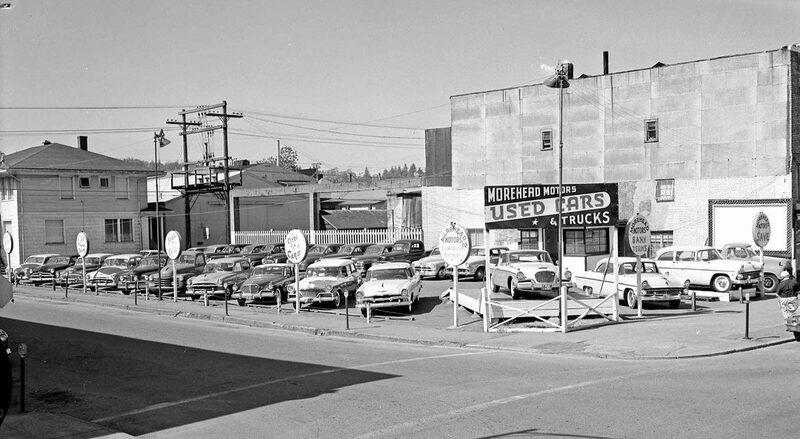 This used car lot would be closest to the 110 West Market Street location, which is at the current-day corner of Market and N. K Street. The location is still a parking lot, and the apartment building with the hip roof in the background still exists. Amazing that the apartment building, which does not seem to have been especially well maintained, survives, while the buildings behind it are gone, and the building which bordered the lot appears to have been torn down and replaced. I believe that car behind the upright sign is an English car. Could be Austin, Wolseley or Vauxhall. My first glance thought it was an Australian Holden FB, but no. Not completely sure which car you’re talking about but I can’t see a Velox anywhere. Did you mean the Opel on the front row, possibly a Rekord? Morehead gave up on Studebaker and Packard and became an Edsel dealer. My house in Aberdeen was bought from Morehead’s son, who remained in the used car business. The stretch of Hwy 101 between Aberdeen and the next “mill town” 25 miles south, was Raymond Wa (pop. 3100) . We in Raymond called it the Aberdeen Hwy those in Aberdeen called it the Raymond road. Passing fully loaded log trucks drinking Rainier beer was great sports driving.